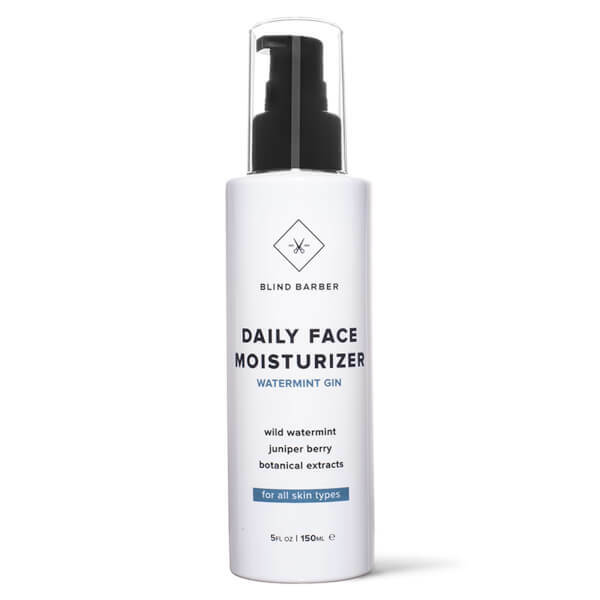 Catering specifically for men, the Watermint Gin Daily Moisturiser from Blind Barber delivers intense moisture and hydration to all skin types. Infused with a cocktail of botanical extracts, including Wild Watermint and Juniper Berry, the lightweight, quick-absorbing formula smoothens and replenishes skin without greasy or sticky residue. Ideal for use after shaving to help close pores and soothe razor burn. Skin feels fresh and comfortable with a subtle scent. Apply to towel-dried skin after showering or washing your face. Water/Aqua/Eau, Glycerin, Persea Gratissima (Avocado) Oil, Glyceryl Stearate, Cetearyl Alcohol , Dimethicone, Caprylic/Capric Triglyceride, Cetearyl Olivate, Coco-Caprylate/Caprate, Sorbitan Olivate, Prunus Amygdalus Dulcis (Sweet Almond) Oil Macadamia Ternifolia Seed Oil, Menthyl Ethylamido Oxalate, Phenoxyethanol, Fragrance (Parfum), Ethylhexylglycerin, Glyceryl Laurate, Avena Sativa (Oat) Kernel Extract, Juniperus Communis Fruit Extract, Angelica Archangelica Root Extract, Sodium Hyaluronate, Titanium Dioxide/CI 77891, Xanthan Gum, Disodium EDTA, Dipotassium Glycyrrhizate, Sodium Hydroxide, Citric Acid, Tocopherol, Potassium Sorbate, Isopentyldiol, Caprylyl Glycol, Amyl Cinnamal, Benzyl Salicylate, Butylphenyl Methylpropional, Citronellol, Limonene, Linalool.